Every PhD researcher, throughout the course of writing, unavoidably becomes an obsessive collector. Our computers are libraries of data clouds that operate sideways to our main projects. Stories, drawings, unfinished videos, incomplete ideas and sketches are stored; they may or may not become part the main PhD document. What is the role of these by-product archives in the development of architectural theory and discourse? 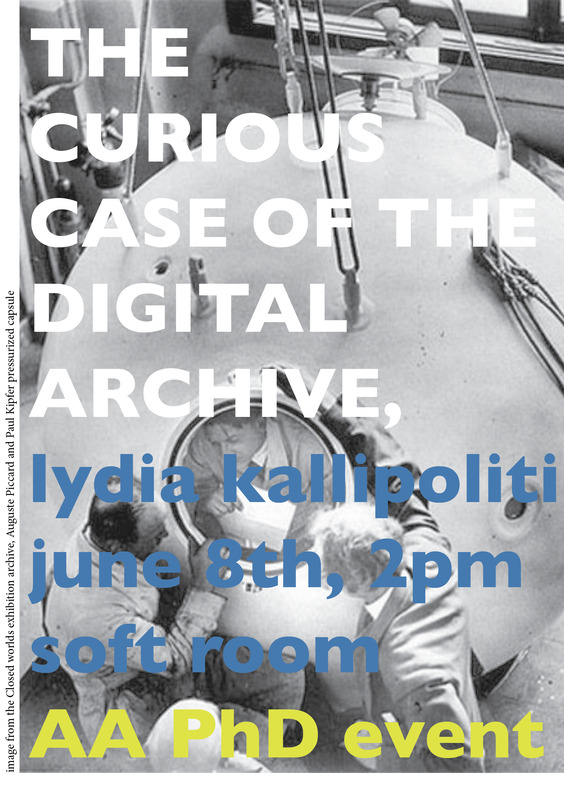 The idea of the archive as a closeted guarded artifact is no longer viable, as the digital archive is a materialized condensation of memory and eventually becomes part of other bigger archives. In many cases, our archives offspring parallel stories that appear as side effects in the history of ideas, rather than being allied with the normative course of what we premeditate as of core historical significance. As Walter Benjamin would say, research occurs in a moment of active distracted perception. Similarly, Robin Evans used the graphic language of electrical circuits to describe the notion of interference in the transference of energy in creative processes, as a type of successful derailment of human actions and as a metaphor for the design process. Deviation helped derail a system from its normative end goal and therefore unveil a “surrogate goal,” which would open new paths of investigation. In the talk, I intend to present two archival research projects Closed Worlds (http://storefrontnews.org/programming/ closed-worlds/) and EcoRedux (www.ecoredux.com), which were byproducts of my PhD. Both projects have engaged different media and digital platforms in order to address a broader and more diverse audience, which was in synch with scholarly writing. In both cases, my intention was to expand academic scholarship to a format of display that broadens the scope of peer-reviewed publications, while at the same time offering different types of engagement with historical material. As exhibitions, publications, conferences, live activities, online digital media platforms, pedagogical experiments and other platforms, Closed Worlds and EcoRedux reveal the contested territory of ideas surrounding environmental design. Lydia Kallipoliti is an architect, engineer and scholar, currently an Assistant Professor of Architecture at Rensselaer Polytechnic Institute. She holds a Diploma in Architecture and Engineering from A.U.Th in Greece, a SMArchS in design and building technology from M.I.T, as well as a Master of Arts and a PhD from Princeton University. Prior to teaching at RPI, Kallipoliti was an Assistant Professor at Syracuse University and an Assistant Professor Adjunct at Columbia University [GSAPP] and at the Cooper Union. Kallipoliti teaches seminars on material culture, history of technology and theories of waste and reuse, as well as closed and self-reliant systems and urban environments. Her research focuses on recycling material experiments and the intersection of cybernetic and ecological theories in the twentieth century.